All paths lead to Rome, says an old proverb. Once the center of the western world, Rome has seemingly endless layers. It’s a magnificent city where millennia of history lurks from every corner. The hub of the Holy See, it’s one of the most important cities in the religious world. It’s also cosmopolitan, full of flavor and color, with the appeal of the Mediterranean. And, lastly, it’s a city to fall in love! The many sides of the Italian capital make it the perfect getaway for lovers. It’s the place can stroll side by side across the picturesque little streets. As you both get lost walking the steps of emperors and gladiators, every corner will offer a new flavor. Everywhere, the food is delicious… and, of course, gelato. Food is always a reason to return to Italy, even beyond the wonderful sights. Feel like spending a romantic weekend in Rome yet? Here’s what I’d recommend you to do! Located in the old and now trendy downtown neighborhood of Monti, Roma Luxus was originally an 18th century convent. These days, it’s all you’ll ever need from a luxurious boutique hotels. It retails numerous details from the centuries-old building, including the impressive façade. The newer parts are all modern, with gorgeously designed common areas and with a tropical colorful touch! A bit eccentric and cool! The rooms are wide, cozy and luxurious, perfect for a couple looking to spend some quality alone time. Our suite (303) had a gorgeous bathtub in the living room and gorgeous Italian-made furniture together with a small balcony, putting you among the roofs in this ancient part of Rome. 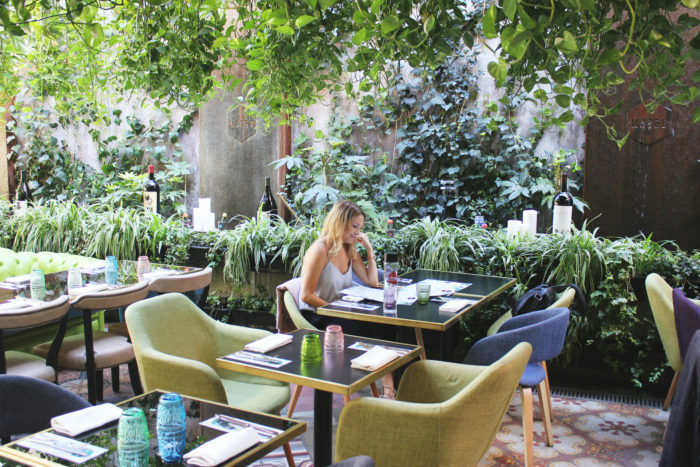 Lunch at the lush and hip Madre restaurant is a perfect spot for Instagram lovers or for a relaxing afternoon with delicious Italian food. 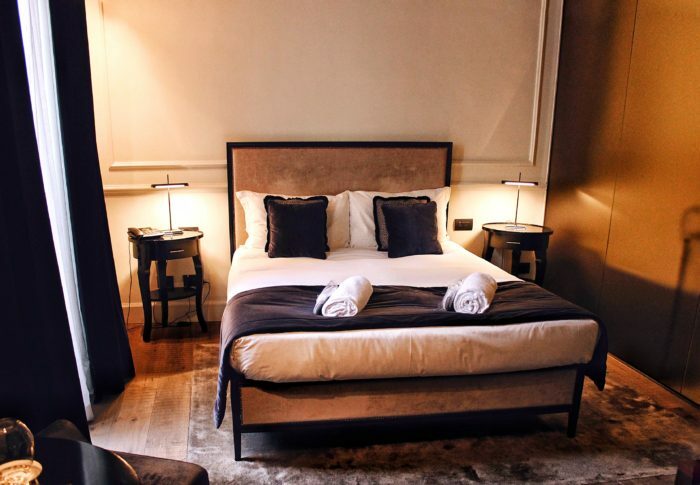 Steps away from must-visit Piazza Navona, Gens Luxury Suites is downright dreamy. 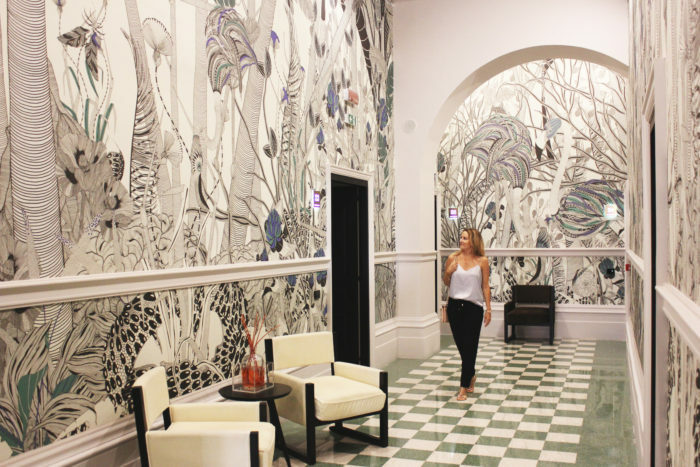 It’s on the third floor of a gorgeous old building, originally built in the Renaissance. Located in an apartment building it feels more like staying in someone’s home than in a hotel. This is a fantastic hotel for those who, like me, can’t resist a well-crafted and beautiful aesthetic. The interior design here is warm, elegant and modern, using beautiful high-quality materials. The palette is warm and luxurious, and it feels like walking into the home of someone who loves design. I could easliy have made our Cornelia Suite to our home for a month or two! The ultimate reason the Gens is perfect for a couple’s retreat? The spectacular service. You’ll be treated to a welcoming drink upon arrival, and get pampered throughout your stay. We got breakfast in bed every morning at no extra charge, for a fully relaxing experience! Once you’ve settled in, it’s time to get to know the Eternal City. Rome is like an onion, with layers and layers of history in every corner. The most ancient parts of the city, sometimes dating thousands of years, are a remarkable sight. Landmarks abound! You can start your voyage into ancient Rome by heading to the ruins of the Forum Romanum. It was once the center of social and political activity, and it oozes a vibe of greatness. 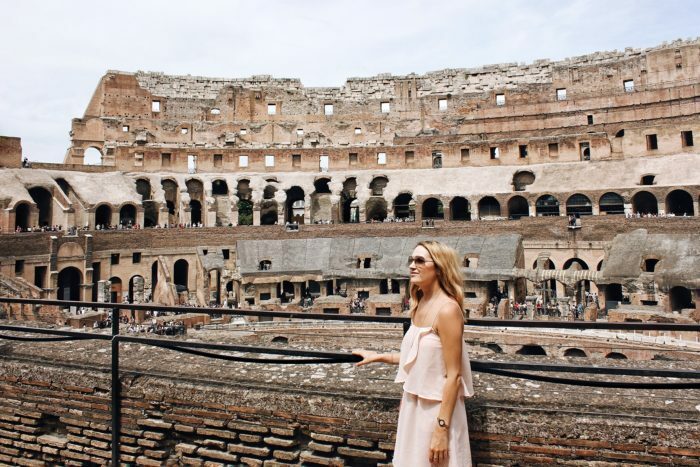 A visit to the majestic Colosseum is a must and a short visit to Piazza Venezia for some Italian grandeur from the Middle Ages is also a great idea. This remains the central hub of the city, and a testament to Italy’s presence throughout the centuries. 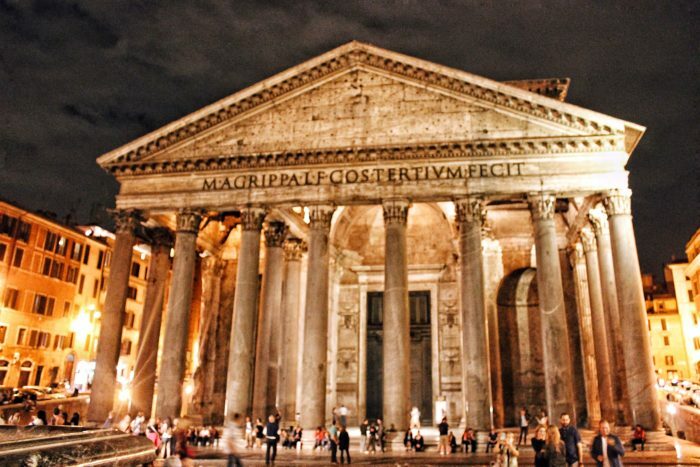 Afterwards, go to the Pantheon to pay respects to the greats who have graced the city. The best-preserved building from Ancient Rome, it’s been a church since the early Middle Ages. 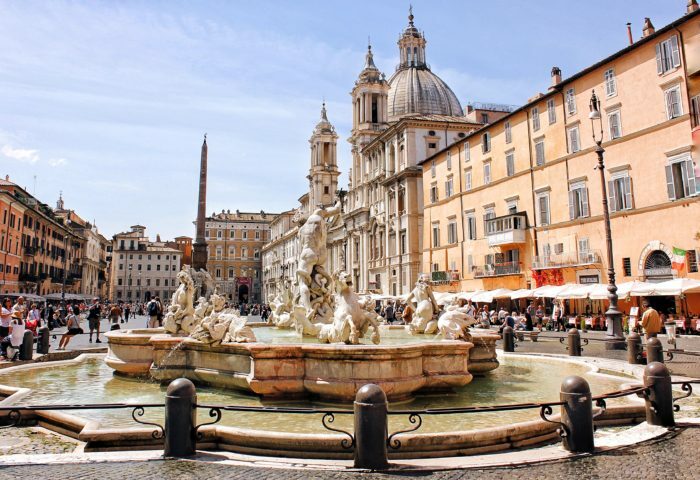 Piazza Navona is one of the most beautiful squares in the world, and a definite must visit. And, of course, no visit to Rome would be complete without a visit to the Vatican. The former, a testament to the gory past of Rome; the latter, a breathtaking religious city full of grandeur and luxury. After some shopping, head to the Spanish steps and just enjoy the vibe of this city! 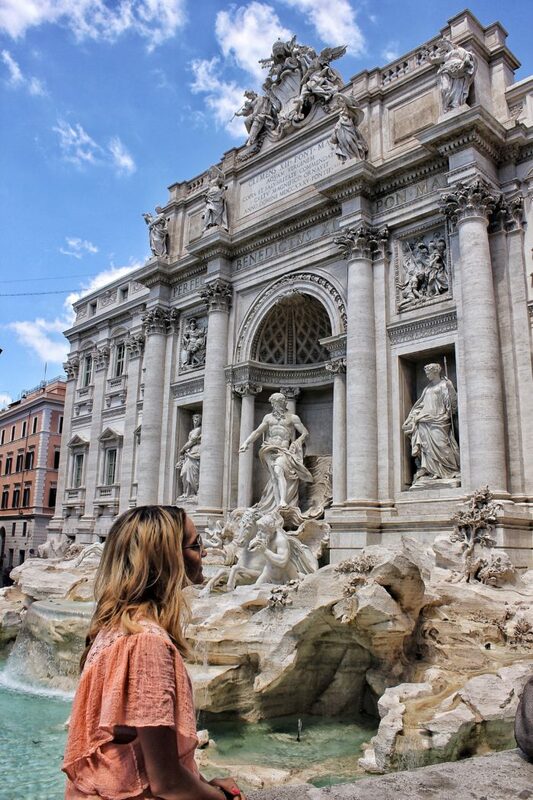 When you’re close to leaving, head over to the Fontana di Trevi. Then, throw a coin: it is said that by leaving a coin at the Fountain, you’ll surely return to Rome! Rome is a magic city but also a truly popular one so for some more peaceful and romantic moments with the history, I recommend you to catch the early morning greatness. It is quite an unforgettable feeling to have these magic places almost by yourself! The most romantic thing you can do in Rome, and in any other old city, is to simply let it guide you. Walk away from the crowds and delve deep into the secrets of this ancient metropolis. My favorite area to do this is right around the corner from Piazza Navona, in Via Dei Coronari. A picturesque neighborhood with a beautiful square and a labyrinth of picturesque streets. It’s the perfect spot for people gazing. Watch the stylish Italian ladies strutting about in high fashion, the sweet families. 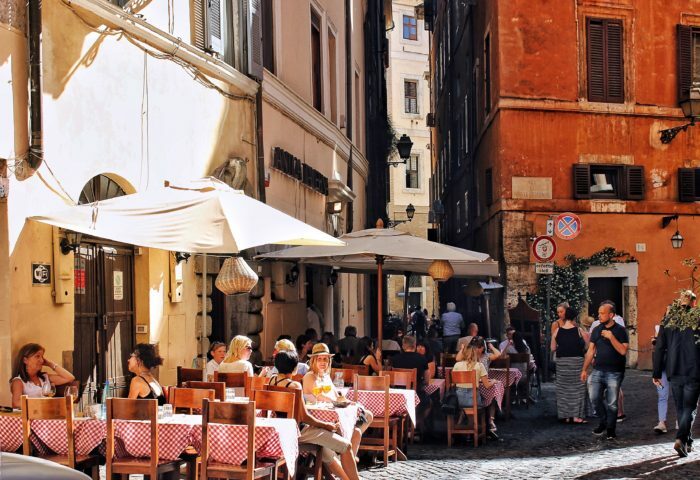 Become one with this cultural icon, as you’re surrounded by the thriving social life of Rome. In this area, you can find lots of antique shops, bars and restaurants, and it’s much less touristy. Another lovely area to get lost in is Trastevere, with its amazing views of the Tiber river. A favorite spot for locals, it’s well beyond crowds and full of cute little places to eat and drink. The sights here, straight out of a postcard, are lovely and oh-so-romantic! 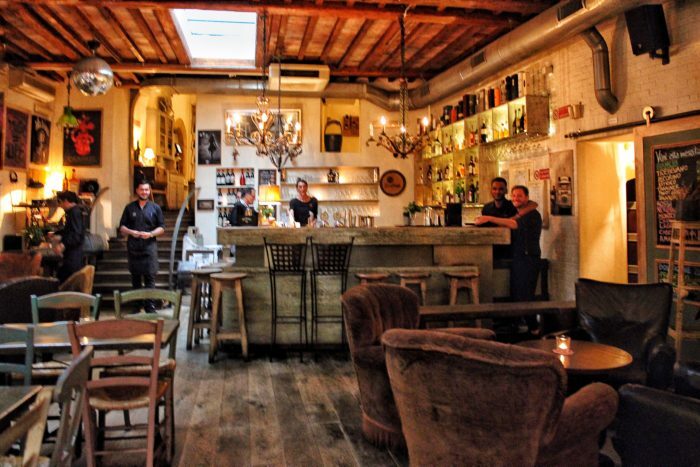 Near Piazza Navona, Etabli is a hip triple threat: it’s a restaurant, a cocktail bar and a café. Couples who love beautiful places should feel right at home here, in the mix of traditional and trendy. Innovative, elegant and warm, it’s got amazing traditional and fusion dishes and a fine selection of wine. A superb spot for a romantic dinner! Il Corallo is a place to enjoy Italian cuisine just as la nonna intended. A trattoria specializing in pizza, it’s your typical Italian restaurant. The atmosphere at this family-owned eatery is warm and friendly, always full of “regulars.” Great for a night of chilling with your loved one. 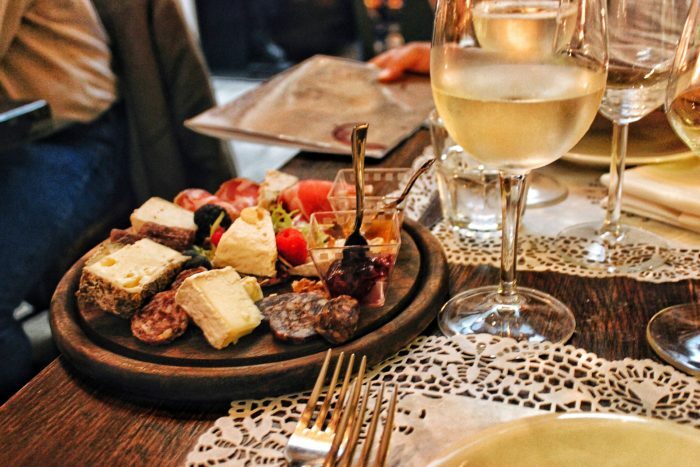 Looking for a fancy dinner to greet or bid farewell to the Eternal City? Osteria Fernanda should become your next favorite place. We found this little Trastevere gem almost by chance, as it’s a little hidden. It was worth all the trouble! Modern and simple in design, it’s an elegant restaurant for fine local cuisine. A great dining choice at very reasonable prices, where you can indulge in Italian flavors and wine. 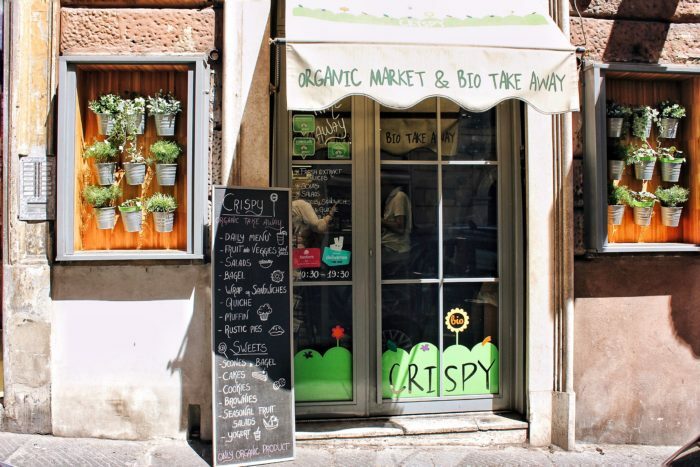 For a healthy lunch head to the Crispy Organic behind the Spanish Steps. A true gem for the healthy one! 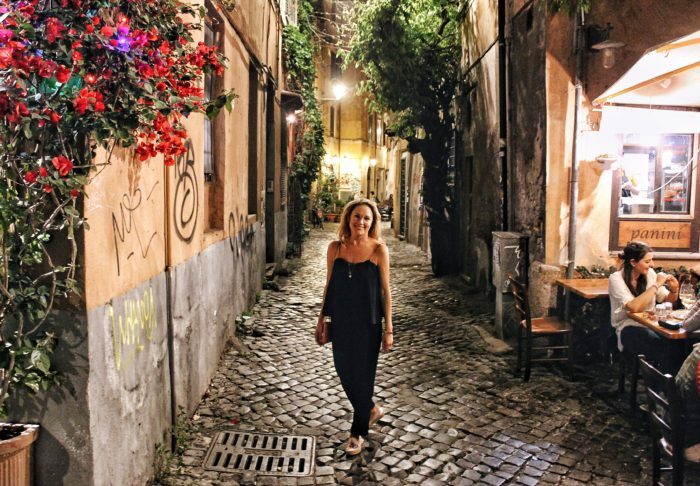 Rome is a city that never sleeps so stay out late with the locals and enjoy the vibrant Rome nights. Bar del Fico is a popular place for locals and tourists with great cocktails. 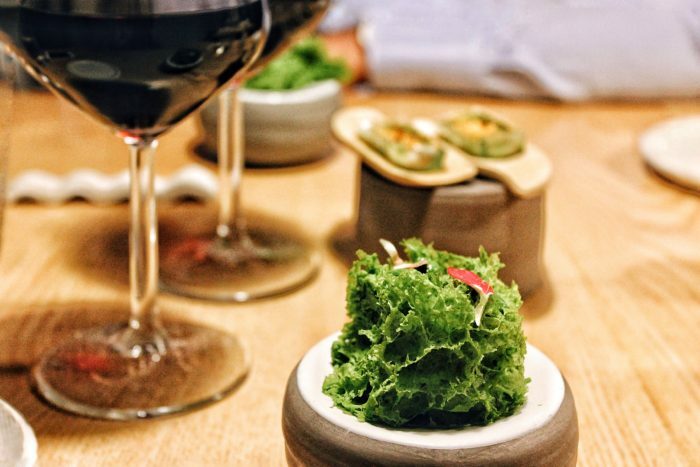 For a bit more classy experience head to Salotto 42. Finally, when in Rome, icecream is a must. Find your favorite in the many ice cream stands throughout Rome and if you are in Trastevere head to Fatamorgana. The cue outside is worth joining for sure! Oh, those Roman nights! The Italian capital lights up in the evening, offering a whole new perspective of this enchanted place. Rome is pure magic after sunset, as the crowds become thinner and the lights dim out. Walk by landmarks like the Colosseum in the evening and see them in a totally different way. Go by the river for a romantic promenade hand in hand, an experience you’re unlikely to ever forget. And then just see the bright lights everywhere… because you both deserve to experience Rome together at night! I’m Linda, a Swedish boutique hotel & hip eatery lover that seeks experiences beyond the crowds all over the world together with my boyfriend Fredrik.